CAPE TOWN, Mar 12 2014 (IPS) - Despite an increase in diagnosis times, South Africa is facing a growing drug-resistant tuberculosis (TB) burden as nationally there remains a large gap between the number of patients diagnosed with multidrug-resistant TB (MDR-TB) and those who start treatment. Between 2007 and 2012, recorded cases of MDR-TB, which is resistant to at least two of the primary drugs used to combat standard TB, almost doubled. South Africa has improved its ability to test for drug-resistant TB by introducing GeneXpert, a rapid testing machine that can diagnose TB in sputum samples in less than two hours. But in 2012, just 42 percent of patients diagnosed with MDR-TB began treatment, according to government figures. The success rate for those on treatment is about 40 percent. “If we don’t do something about it now, MDR-TB is going to become XDR-TB [extensively drug-resistant TB],” Dr. Jennifer Hughes, a drug-resistant TB doctor with Médecins Sans Frontières (MSF), told IPS. XDR-TB is a strain of TB resistant to at least four of the main TB drugs. Most of South Africa’s provinces have increased their treatment capacity for MDR-TB patients after the government introduced a 2011 framework for decentralising MDR-TB care. This allows patients to start treatment at sites closer to their homes instead of the country’s few specialised TB hospitals, where a typical stay is six months. But provision of treatment at primary healthcare level needs to increase, Dr. Norbert Ndjeke, director of the Department of Health’s DR-TB, TB and HIV division, told IPS. “[Decentralisation] is not moving at the speed we want it to,” admitted Ndjeke. There is no special budget for decentralisation and provincial governments choose how to prioritise their spending, he said. The number of sites MDR-TB patients can start treatment in the Western Cape, Gauteng, Eastern Cape, and the Free State provinces has quadrupled due to decentralisation. The number of sites in the Western Cape, for instance, went from four to 17, while Gauteng now has five treatment sites instead of one. Limpopo Province has not added new facilities, while North West and the Northern Cape provinces have doubled available treatment initiation sites, going from one to two, and two to four, respectively. When properly implemented, decentralisation can cut the treatment gap. In Khayelitsha, a large semi-informal township on the fringes of Cape Town, a combination of quicker testing and decentralisation has led to the time between diagnosis and treatment for drug-resistant TB dropping from 73 days to just seven days between 2007 and 2013, according to data by MSF. Ninety-one percent of patients diagnosed with MDR-TB in Khayelitsha in 2013 began treatment. Ndjeke noted that provisional national data for 2013 indicates that 10,095 MDR-TB patients began treatment. Figures are not yet available for the number of patients diagnosed during that period, but in the first nine months of the year 7,271 patients were diagnosed with MDR-TB, possibly indicating a shrinking gap between treatment and diagnosis. Accurate recording and reporting of patient numbers and outcomes remains a challenge, and the government is working to improve its systems, he said. 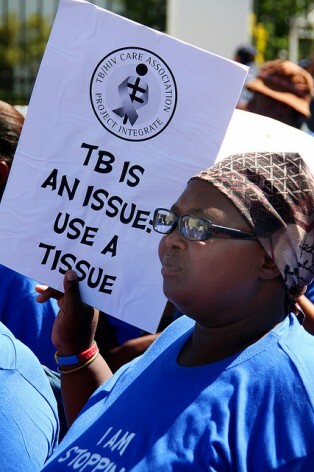 South Africa has the world’s third-largest TB burden, after India and China, according to the World Health Organisation. It also reports the world’s most cases of XDR-TB, a virulent form of the disease that is resistant to at least four of the main TB drugs and has a treatment success rate of less than 20 percent. An estimated one percent of the population of about 51 million develops TB every year. “We have in South Africa one of the only rising epidemics of drug-sensitive TB and drug-resistant TB. And we are not doing very well at detecting it and treating it,” said Gilles van Cutsem, MSF’s medical coordinator for South Africa and Lesotho, at a media briefing. Doctors are concerned about the rise in transmission of drug-resistant TB. When drug-resistant TB started emerging it was mainly due to patients not being able to complete their full course of treatment for standard TB, said MSF’s Hughes. But now most drug-resistant TB transmission happens through people breathing it in from others, she said. One of the main challenges for treating drug-resistant TB is that the available drugs come with side effects including nausea, vomiting and permanent deafness, which often deters patients from finishing their treatment course. “The drugs are horrendous – it’s a terrible regime but it’s the best they’ve got,” Hughes told IPS. On average, patients need to take between 12 and 15 tablets daily for two years, she explained. South Africa is running a clinical access programme for up to 200 XDR-TB – and pre-XDR-TB patients with limited treatment options for a new drug called Bedaquiline, the first drug designed specifically to treat TB in over 50 years. One of the features of the drug, which is taken along with other drugs, is that patients get better a lot quicker, said Dr. Francesca Conradie, clinical advisor to Sizwe Hospital, a MDR-TB hospital in Gauteng. “It’s the first in a pipeline of maybe four or five drugs that will revolutionise the way we treat MDR-TB,” said Conradie. Based on the outcomes of this initial programme, South Africa’s Medicines Control Council will decide whether or not to register Bedaquiline for use for more patients. A new regime of drugs for drug-resistant TB patients could be ready by 2022 based on the outcomes of existing trials, said van Cutsem.